It’s been just over a year since the first Five Go To Sea conference cruise. Kay Laurence organized it to celebrate her 60th birthday. She invited Ken Ramirez, Dr. Jesús Rosales-Ruiz and myself to participate in a five day adventure in the Caribbean. Planning for our Caribbean adventure during the winter Clicker Expo: note the snow in the background. We were definitely looking forward to the April cruise. If you’re counting, that’s four. Five referred to the each of the conference attendees who joined us. The reference goes back to Enid Blyton’s series of children’s books: “The Famous Five” and the many adventures they went on. Adventures we certainly had. 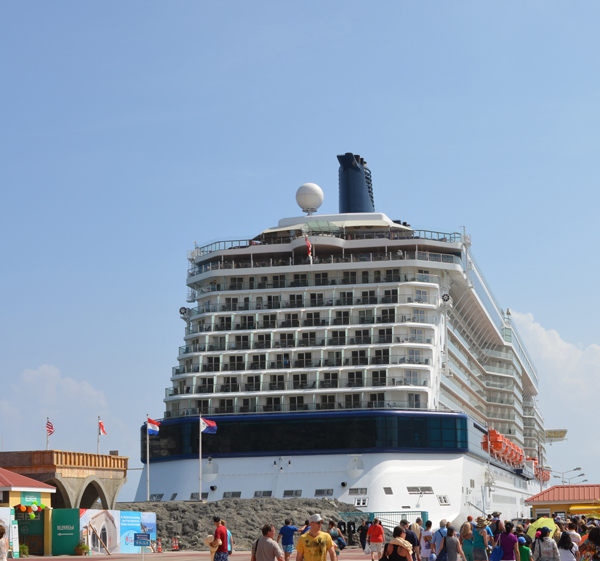 This was my first time on a cruise ship, my first time on the open ocean, my first time in the Caribbean. For me, it was the perfect mix of intense learning and holiday adventure. We spent our days at sea engaged in the conference. 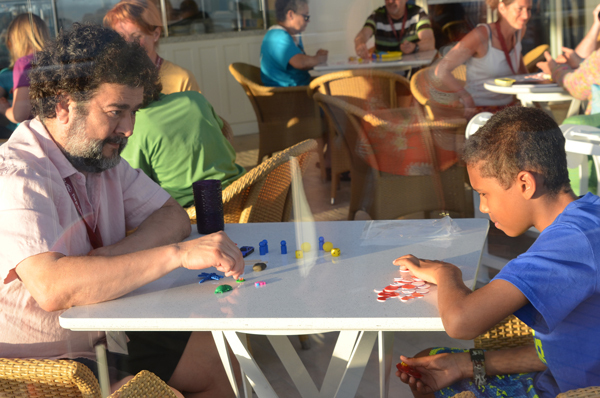 Each evening from the top deck we watched the sun set over the ocean while we played the learning game PORTL. That was followed by more conversations at dinner in one of the many restaurants the cruise ship had to offer. Jesús and the son of one of the conference participants deeply engaged in a PORTL learning experience. Note: Jesús is the one being “trained”. 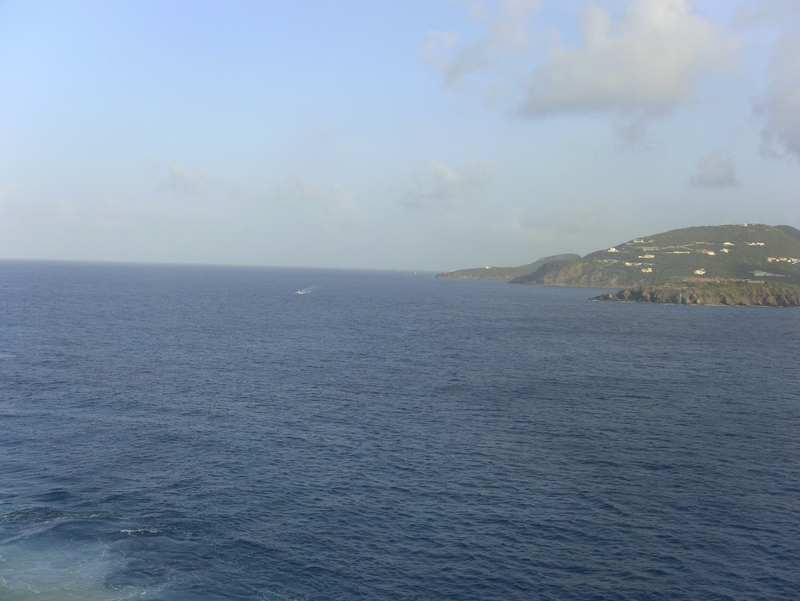 On excursion days we headed off to explore the Islands we stopped at. People went snorkeling with sea turtles and dolphins. Kay took a group Segwaying through the historic district of one of our ports of call. I joined Ken one evening to go zip lining through the treetops of a tropical forest. I returned home with a notebook bulging with notes. Our days had not followed the usual format of conferences where you have rigid time schedules: this lecturer is presenting from 10:00 to 11:00, and then he has to stop so another speaker can begin. No, this conference was centered around the ideas we were presenting and the questions people had. The schedule was flexible. We could give each topic the time it needed. If we found a gem that needed mining, we took the time to explore it. We could each contribute, ask questions of the other presenters, add our own take on the subject. What evolved through this more relaxed format was an amazing exchange of ideas. My notebook was stuffed full of page after page of things I wanted to think about further. For me the highlight of the conference was Jesús’ talk on Regression and Resurgence. I had first heard him give this talk at the Clicker Expo during the winter. During the cruise, it was my number one request. I wanted to hear that talk again. Because we had the luxury of time, Jesús expanded beyond what he had presented at the Expo to give us a much deeper understanding of the subject. 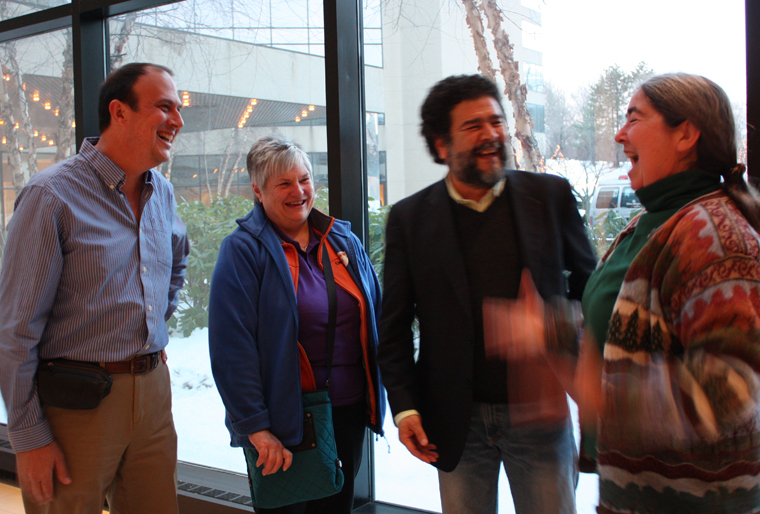 Jesús with two of the conference participants enjoying the perfect setting to discuss training questions. To help process everything he covered, when I got home, I wrote a detailed report on this presentation for my on-line course. In it I described both what Jesús had covered and then I related each topic directly to horse training. If you work with other species, I think you will find that the translation is still relevant. Posts of this sort are read, enjoyed, and used at the time they are written, and then they get buried under the mountain of other posts that come into our in-boxes. Almost every day I will read questions from people that make me think about Jesús’ talk. His material adds so much depth to our understanding of how shaping works. It is fundamental to our understanding of the training. His talk shouldn’t be buried in the archives of a computer. It needs to have a more public and permanent home, so I am going to post it here in my blog. It is a long post, some forty pages overall. That’s much too long for a single blog, so I am going to present it instead like one of Dickens’ novels. You’ll get it in installments so you can enjoy it one gem, one chapter at a time. This is Part 1 of a 15 Part series. 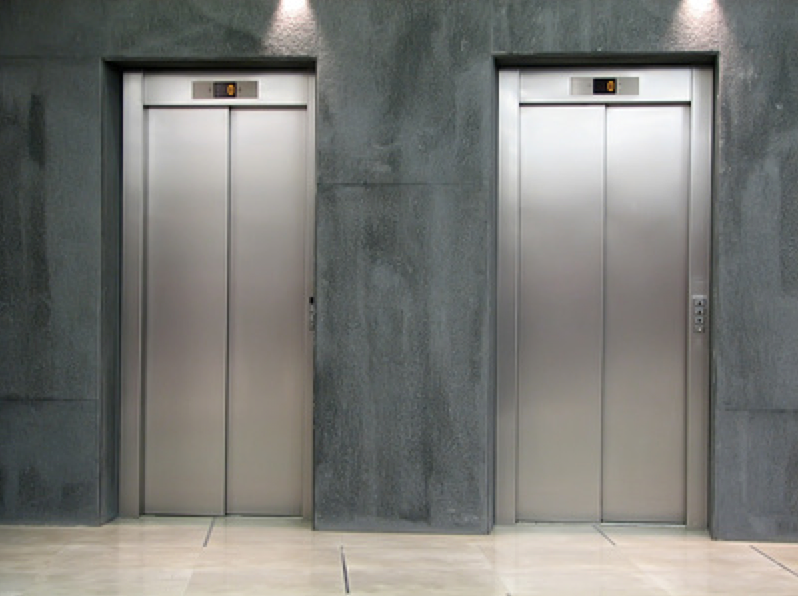 What would you do if you were trapped in an elevator? You’d probably push all the buttons. You’d bang on the door. You’d call out in the hope that someone would hear you. But what if none of those things worked? What would you do then? Would you wait patiently for the help that you know would be coming? Or would end up huddled in a corner calling out for your mother? That’s what happened to a professor at a conference in Mexico. By the time help arrived, she had regressed back to very early childhood behavior. Our horses sometimes show similar types of regression. You aren’t reinforcing your horse at your usual rate. He becomes confused and frustrated. What do you want? His version of pushing all the elevator buttons is throwing other behaviors at you that you’ve previously reinforced. He’ll try lowering his head, putting his ears forward, “posing”. When those don’t work, he’ll regress further back. He’ll nudge your arm. He’ll paw. He may even bite at you. That got your attention! Regression reveal’s an individual’s past. When you’re tired and under stress, how do you behave? Do you find yourself regressing back and behaving like a cranky teenager – or worse a spoiled toddler who needs to be put down for a nap? What are we learning about the child that you were? In other words under stress we tend to revert to older ways of behaving. So regression is a product of an extinction process. When behavior that was being reinforced no longer works, you regress back to previously learned behavior. When that doesn’t work, you go back another step and then another. As Jesús said, very tongue in cheek, during the extinction process we see behavior that was modeled in childhood. If one of his students is acting out, he tells them – “Don’t blame me. Blame your parents. You’re simply presenting behavior that was modeled for you in childhood.” If you want to learn about family dynamics, watch toddlers. So extinction can reveal the history of the individual. ← Today’s Peregrine Story #16: Happy First Day – Thank You! I’m looking forward to future installments – this topic fascinated me at last ClickerExpo. A fascinating topic, indeed! The concept that in this context intrigues me especially is the one of “extinction”. Which maybe will be treated in future installments ?